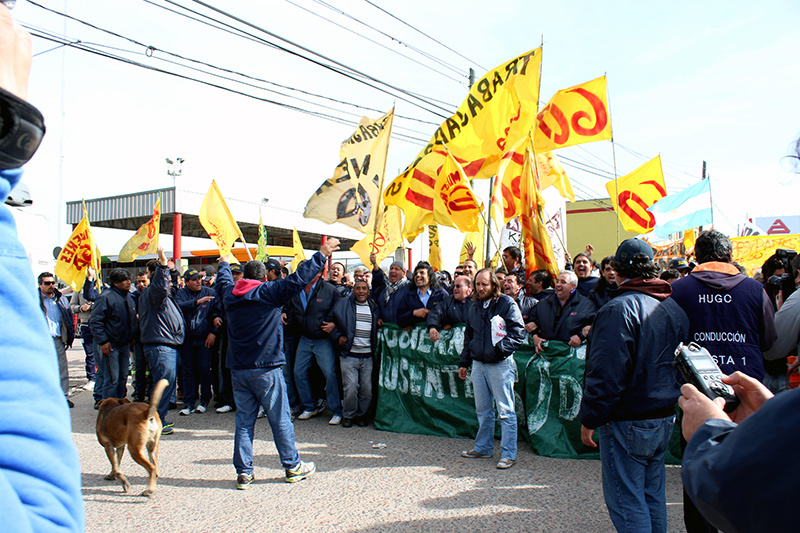 After a marathon 41 day struggle, the 1,200 bus drivers of the Line 60 bus service in Buenos Aires returned to work on August 5 after winning the reinstatement of fifty sacked workmates. This historic strike by the drivers, known as “choferes” in Argentina, successfully ‘twisted the arm’ of the triple alliance of bosses, government and the leadership of the Union Tranviarios Automotor (UTA – Tram Drivers Union) that was lined up against them. This dispute began in June with the sacking of a delegate from the DOTA bus company. The initial protest action at the end of June saw the Line 60 drivers refuse to charge passengers for bus tickets, which gave them free transport for three days. Their aim was to register their protest by targeting the company’s revenue without inconveniencing the 250,000 passengers that use this service every day. DOTA responded by sending telegrams to an initial 47 employees to inform them that they had been sacked. Then on the afternoon of Saturday June 27, DOTA representatives vacated the company offices at its bus terminals and removed the keys from all the buses (locally known as “colectivos”). The Line 60 workers were now effectively locked out. The choferes knew that they were in for a tough fight against a major player in the privatized bus transport sector. DOTA runs around 40 of the 110 bus lines in Buenos Aires and receives 90,000 pesos a month in subsidies from the government for each of its 1700 vehicles. They also knew that the leadership of their own union would be of no help. The Secretary General of the UTA Roberto Fernández simply accepted these layoffs as a fait accompli. Fernández is a leader of the conservative Peronist “official” wing of the CGT (General Confederation of Labor) union federation. The drivers of Line 60 responded to the company’s lock out and the sacking of a total of 53 drivers with weeks of militant direct action. Mass pickets that block off major roads, known as a “corte” (cut) in Argentina, saw the main Pan-American Highway and other major bridges regularly blocked during the morning peak hours. The July 28 “corte” was violently attacked by police with tear gas and rubber bullets, with several picketers being injured and five arrested. The Secretary for Security and Peronist FPV (Front for Victory) leader Sergio Berni was happy to justify this brutal repression. 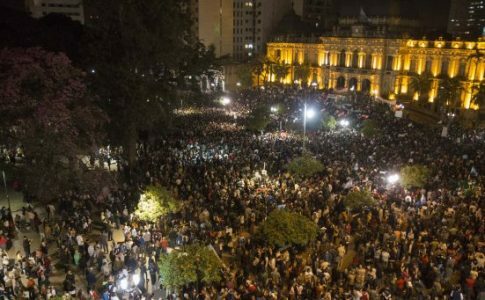 The choferes also held a number of demonstrations through the streets of Buenos Aires, including a march on July 9 along the traditional demonstration route from the Congress building to the Plaza de Mayo, and another march to the Ministry of Labour on July 16. These demonstrations were led by a sea of drivers in their blue uniforms waving their yellow Line 60 flags, followed by the banners of the Women’s Commission of Line 60, the “Madres y Padres de la 60” (The Mothers and Fathers of Line 60), as well as hundreds of militant supporters behind them. Despite the fact that these bus drivers officially belong to the Peronist UTA union, their struggle was led by their own “comisión interna” (internal commission), a grassroots committee elected by rank and file members that operates independently of the union bureaucracy. At Line 60, this body is called the Cuerpo de Delegados (Shop Stewards’ Committee), and has both left-wing and Peronist workers among its delegates. The Cuerpo de Delegados operates by holding regular asambleas (assemblies – mass meetings) where the majority of all decisions are made. The workers vote on and take direct action whether the bureaucratic union leaders like it or not. This Committee has extended its influence to other bus lines and has formed a Coordinadora (Coordinating Committee) called “Interlíneas” that brings together workers in some of the most important bus companies. There were other key elements to the victory of the Line 60 drivers. One of these was the strong solidarity forged between the three far-flung bus terminals – Plaza Constitución in the south of the city center, the Maschwitz terminal in Escobar in the city’s north and the Rincón terminal in Tigre in northern Greater Buenos Aires. A second was their highlighting of the stark contrast between DOTA’s huge profits and the huge subsidies that they receive from the government, with the poor conditions that working people are forced to endure on the bus system. The drivers also raised the demand for “estatización” – the placing of the privately run bus companies into public ownership. Demonstrations of the Line 60 drivers were led by a banner that read “Estatización de la Línea 60. Ni un solo despido” (Nationalize Line 60. For not one single layoff). 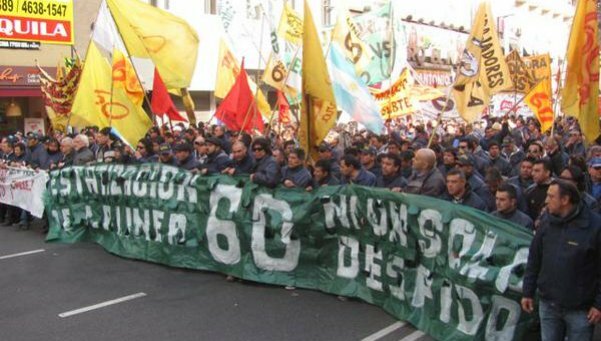 The struggle of the Line 60 drivers was warmly supported by the workers and young people of Buenos Aires. Line 60 is one of the most iconic bus routes in the city, which locals lovingly refer to as El Sesenta (“The Sixty”) and El Internacional (The International). This second nickname stems from the fact that this bus route passes a whole range of local landmarks – from the city’s commercial district, Recoleta Cemetary and Chinatown to both stadiums of fierce football rivals Boca Juniors and River Plate. 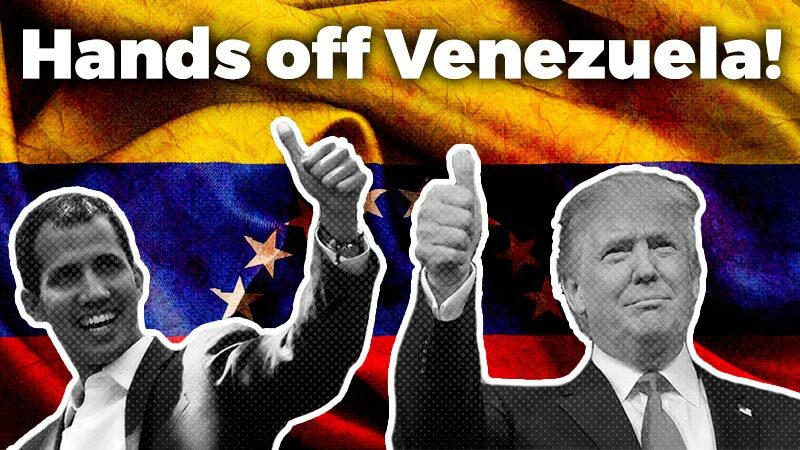 El Internacional also delivers students to a range of university faculties and campuses, the sick to a number of hospitals, and protesters to the Embassy of the United States. An important array of organizations contributed to the victory of the Line 60 “choferes”. Militant workers’ groups, human rights organizations and left-wing parties displayed their solidarity with the bus drivers from the beginning. Human rights organizations spoke out strongly against the police repression suffered at the “cortes” of the Pan-American Highway. Workers also counted on the support of the left, with the presence of various comisiones internas such as those from the food processing plant of Kraft Mondelez (ex-Terrabusi) and the Lear manufacturing company, members of militant rank and file groups such as La Lista Bordó (Burgundy List) from the print industry and workers from the Madygraf (ex-Donnelley) printing plant now occupied and operated by its workforce. The workers also received financial contributions that allowed them to keep up their struggle for a month and a half, including contributions from elected parliamentarians of the PTS in the Frente de Izquierda (Left Front), including national deputies Nicolás Del Caño and Myriam Bregman as well as the deputy from the province of Córdoba Laura Vilches who together donated 45,000 pesos to the strike fund. 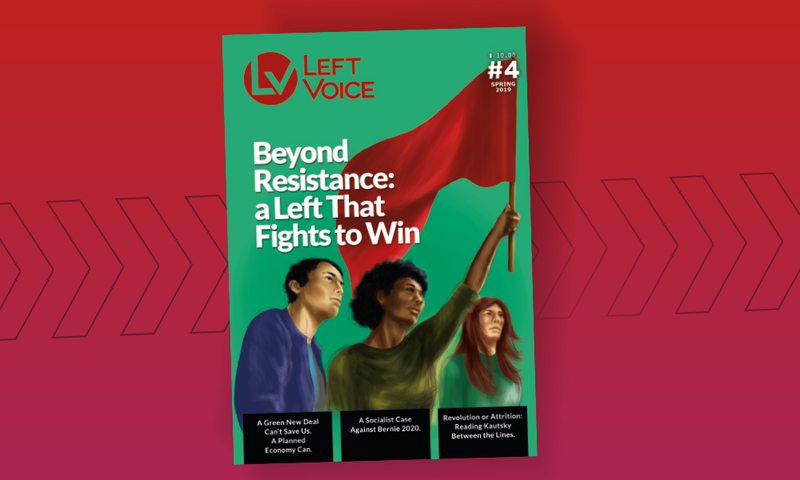 After a month and a half of resistance and persistent struggle, victory was finally achieved on August 4. The morning saw another well-attended “corte” of the Pan-American Highway. That same afternoon, the Ministry of Labour held a new meeting with the Line 60 delegates. It was there that the need to reinstate the sacked workers and payments for wages lost during this struggle was agreed to. Later that night, the Cuerpo de Delegados called an asamblea, where the bus drivers voted to accept the new proposal from the Ministry of Labour. Fifty of the sacked drivers are to be the reinstated, with an obligatory conciliation process to take place to resolve the issue of the three remaining sacked workers. The drivers are to be paid 11,000 pesos in two parts (6,000 pesos today and 5,000 pesos in the coming week), and paid for 50 percent of all days lost during the dispute. Not only that, but the company has agreed to officially recognize the Cuerpo de Delegados as the representatives of the workers and grant its members twelve days of paid trade union leave. This is simply unheard of for any dispute settlement within the UTA. The “choferes” have now returned to work. They have achieved a first victory in the face of the alliance of the DOTA bosses, the UTA and the national government. 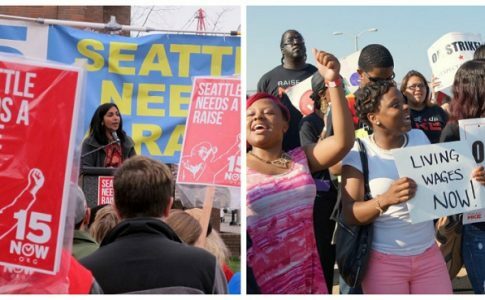 With this victory many workers can see that with determined struggle, it is possible to twist the arm of the bosses, the state that defends them and the union bureaucracy that all too often betrays their struggles. 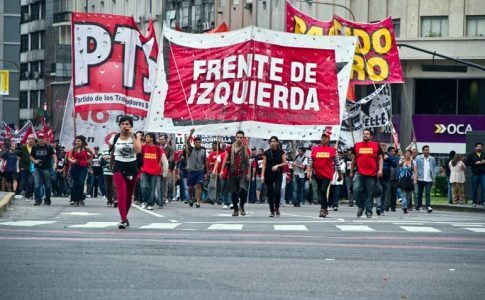 La Izquierda Diario will continue to report on the fulfillment of the agreement reached and on a struggle that has without doubt now entered into the history of the workers’ movement of Argentina. This article was based on previously-published articles from La Izquierda Diario.